When we’re talking about the best wetsuits for surfing, what we really mean is that the wetsuits that are best for surfing are wetsuits that are made specifically FOR surfing. Sometimes people who engage in other water sports , for example, scuba diving, and wonder if they can use their scuba diving wetsuit for surfing. In general, the answer is no, because scuba diving wetsuits are constructed differently. They use thicker neoprene because the deeper the water, the colder it gets. Plus they aren’t built for the flexibility needed in surfing. The thickness of the neoprene, combined with style, will correspond to water temperature ranges. This means that colder water (from water in the low 60’s F) will require most people to wear a full suit. As water and conditions get colder it means thicker neoprene will be needed. Warmer water will largely determine the style of wetsuit you’ll need. Water in the mid-60’s for most people, will call for less coverage. In this case, short johns or spring suits are better options. As the water increases in temperature, nothing more than a vest or rash guard will do if you need anything at all. Wetsuit construction becomes more crucial when you come into contact with colder temperatures The most important element of construction is how the seams are put together. The best surfing wetsuits employ seams that are stitched, sealed, and taped because there will be no water seepage from those points. They usually cost a bit more, but it’s worth it in the long run, especially if you will be in the colder waters most of the time. 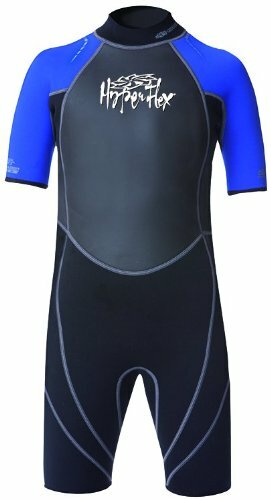 Westsuits are constructed of different thicknesses of neoprene for different temperature variables. The numbers represent millimeters of thickness. For example, a 3/2 wetsuit means that in the torso area it is made of 3mm while in the arms and legs it is 2 mm. A 4/3 or 5/4/3 means that the suit is made from 3 different thicknesses. Many companies manufacture surfing wetsuits, with some being the industry leaders and some tending to be more off-brand names. The leading companies for the best surfing wetsuits include Rip Curl, Patagonia, Xcel, O’Neill, Billabong, Quiksilver, Body Glove, and Hyperflex. The best approach for buying a wetsuit is to try on a few and to get an idea of which company’s designs are best suited for your body type. People often find that certain manufacturers’ cuts tend to fit them better than others. For instance, O’Neill consistently works best for some people than do Rip Curl or Body Glove. Other people, on the other hand, may find that Rip Curl designs give them a consistently better fit. In terms of fit, another consideration for women is to always go with wetsuits made specifically made for women because they are anatomically correct, making them more comfortable. In general, wetsuits should be snug fitting with as few wrinkles as possible. In the water, neoprene expands, loosening the fit, and the more wrinkles, the more potential for it to hold water. A possible exception to this rule would be children’s wetsuits, in which case a few wrinkles will not be such a concern because they will eventually grow into them. 77° F (25 C) and above - Most people are comfortable without any coverage, but a rash guard or vest is good for sun and surf rash protection. 72° to 77° F (22 to 25 C) - A shorty (shortjohn) or spring suit will suffice for cooler morning and windy afternoon sessions. These suits are generally a 3/2 thickness. 63° to 72° F (17 to 22 C) - You could go with either a shorty, spring suit, or get cold. If all you have is a 4/3 full suit, it may be too warm. 59° to 63° F (15 to 17 C) - Too cold for a shorty for most people. At the least you’ll need a 3/2 full suit, and maybe booties if you don’t like cold feet. A 4/3 maybe better for people who get cold easily. 54° to 59° F (12 to 15 C) - This is 4/3 and booty territory, and possibly even a hood if it’s windy. At the bottom end, a 5/3 suit may be best for some people. 48° to 54° F (9 to 12 C) - These frigid waters require a 5/3 or a 5/4/3 full suit, booties, gloves, and probably a hood. Below 48° (9 C) - If you’re tough, try the 5/3, but if not, don’t go with anything less than a 6/5/4, and 6 or 7mm booties, gloves, and hood. Priding themselves on their environmental awareness and commitment to clean technology, Patagonia brings this attitude with them into the manufacture of wetsuits. Let’s face it…the manufacture of wetsuits is chemical, fossil fuel and energy intensive and isn’t good for the environment. Patagonia has addressed this in the way they make neoprene. Neoprene involves a process of manufacturing chloroprene monomer. There are two primary methods: one involves petroleum based products, and the other uses limestone. The final products are chemically equivalent, and both processes engage polluting and unsustainable extractive technologies, they admit. But the limestone process at least doesn’t contribute to the possibility of an oil spill. It is this limestone process Patagonia opts for in the manufacture of their wetsuits. The other “green” technology they utilize is recycled polyester and unchlorinated wool. It is the incorporation of wool as a thermal lining in Patagonia’s wetsuits that makes them truly unusual. 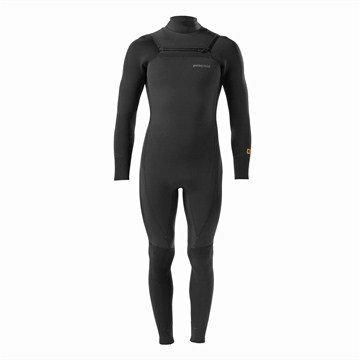 Because the wool is thought to be so superior as an insulator, the wetsuits use thinner neoprene. Even their most heavy duty full suit – the R4 – which they claim is for “frigid” conditions (38° to 48° F, or 3° to 8° C) is only 5/4/3mm neoprene. The R3 is gauged for 48-55° (8-12° C) and is 3mm. The R2 is 2mm and good for 55-65° (12-18° C), and the R1 is 2mm neoprene and recycled polyester. The R1 comes in a reversible long sleeve rash guard in men and women’s sizes, a men’s vest, and two styles of women’s spring suits (one of them, the “Juanita,” is an interesting drawstring style, the likes of which you probably won’t see anywhere else).